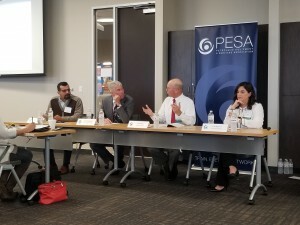 Credit professionals from PESA Member Companies gathered at the 2018 PESA Credit Interchange Division Annual Seminar on October 18 for networking opportunities and presentations from industry experts around the timely topic of preference claims and bankruptcy in the oilfield services and equipment sector. PESA-CID has more than 30 Member Companies who exchange trade credit information and histories on more than 50,000 customers. This data provides a cost-effective way for members to anticipate and reduce financial risk that is unavailable elsewhere in the industry. Additionally, the program provides a strong network of credit professionals. PESA held an election for four CID Operating Committee members. 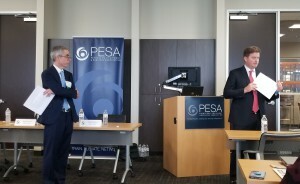 Congratulations to the 2018-2019 PESA Operating Committee: Committee Chairman Randy Friedsam, Select Energy Services; Kara Dixon, Newpark Resources; Lauri McDonald, Patterson UTI; and newly elected committee members Robbie Camfield, Baker Hughes, a GE company; Jason Leslie, NOV; Rosa Rivera, Scientific Drilling; and Keva Wardell, Tetra Technologies. Our sincerest thanks to outgoing CID Operating Committee members Kristy Woolsey, DistributionNOW, Don Burell, Schlumberger and Doug Dunlap, Tetra Technologies, for their dedication and contributions to PESA-CID over the years. Carl Doré and Lisa Aquino, Doré Law Group, provided insight on “Preference Payments in the Bankruptcy Arena,” offering clarification about the history of bankruptcy preferences, why preference laws were created and the definitions of elements within preference claims. John Sparacino, Vorys, Sater, Seymour and Pease LLP, then shared his perspective on “What to Expect, and What to Do, Throughout the Preference Litigation Process,” delving into the preference claim life cycle. Sparacino discussed customers in distress, tips for limiting preference claim exposure and examples of procedures organizations regarding receiving a demand letter around alleged payments. Doré, Aquino and Sparacino then held a panel discussion, opening up to the audience for Q&A. Alternative asset management firm Angelo Gordon representatives Todd Dittmann and Bobby Barrett offered their insight into the E&P, midstream and OFS market outlook and trends of interest. Dittmann and Barrett shared new financing alternatives for E&P companies and revealed how things have changed over the years relative to loans and financing. The Angelo Gordon team concluded by sharing how credit managers can better address private equity counterparty liquidity in the new world. For more information on how to join PESA-CID, contact cid@pesa.org.